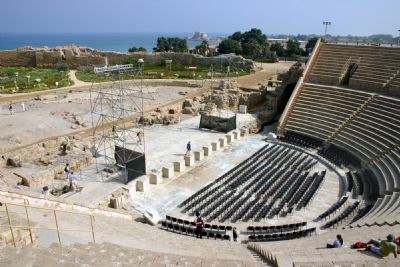 The theater was evidently first constructed by Herod the Great (37 to 4 B.C.) and went through many modifications until it went out of use in the sixth century A.D. This theater (or possibly in the circus) may have been the spot where Herod Agrippa I was stuck with an illness that led to his death (Acts 12:19-23; Josephus Ant. 19.343-52 [8.2]).